We're thrilled and grateful to be able to bring you these two auction lots in addition to the Live and Silent auctions. Featured Auction lots are framed. Bidding starts at $250. 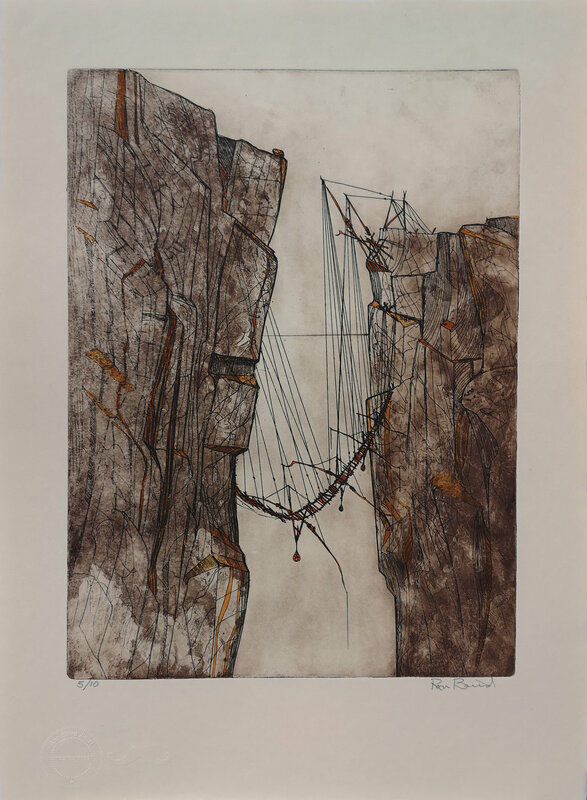 Ron Baird’s Cliff Hanger series is inspired by ancient Phoenician fishing platforms (some of which are still seasonally used), discovered on the Adriatic coast of Puglia in southern Italy. The series is made from material left over from a mural the artist made for the legislature of the NWT in Yellowknife. The paper is archival, made by hand in a British mill in 1979. The ink is French, (Charbonelle) which has long been the world standard for fine etching ink. This series was executed in the spring of 2018. Jay Dart is a drawist who has recently begun creating mixed media installation pieces that bring his two-dimensional narrative works to life. His first public gallery solo exhibition, Greetings From Yawnder!, featuring 80+ drawings and installation pieces, opened at the Robert McLaughlin Gallery in October 2016 before travelling to the Art Gallery of Sudbury in February 2017. In October 2017, Dart exhibited an interactive drawing installation for a solo booth at Art Toronto International Art Fair. He has exhibited at Galerie Youn (Montreal), Art Toronto, Papier 15 (Montreal), Art on Paper (Miami and New York), Love Art Fair (Toronto), Wall Space Gallery (Ottawa), Slate Gallery (Regina), Line Gallery (North Bay), Come Up To My Room (Gladstone Hotel, Toronto), 100 Euro/Dollar Show (Amsterdam, Portland), and the Canmore Artists and Artisans Gallery. He is a recipient of grants from the Ontario Arts Council and, in 2016, won a National Magazine Award for editorial illustration. He received a BA from the University of Guelph’s Fine Art program. Dart lives and draws in Ashburn, Ontario (aka Elsewheres). He is represented by Galerie Youn in Montreal.